Plastic 32 oz. bottle for trigger sprayers. Has ounce and ratio markings on side. Bottle only, spray head not included. Plastic 12 oz. applicator bottle with cap. Great for wax and polish applications. This nozzle features a power flow nozzle with adjustable spray and comfort grip. It's heavy duty, leak proof and has an overall length approx. 6 inches. 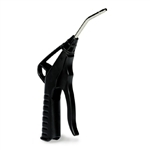 Gilmour commercial pistol grip nozzle is insulated and molded for spraying hot or cold water. It has male hose threaded front for attaching accessories and a heavy-duty, full size, die cast zinc body. It's ideal for commercial or industrial use and features: brass head insert for maximum resistance to extremely hot water, solid brass valve stem with permanent adjusting nut, hold-open clip for continuous spraying, rust resistant stainless steel spring, self-adjusting "duck" packing for lifetime leak proof seal. Vacula blow gun has a 4" full flow tube and rubber tip. 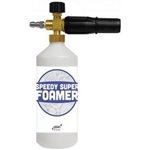 The Speedy Super Foamer creates super foaming soap by mixing high pressure water flow from a pressure washer with soap and air. Adjustable spray pattern from a jet stream to a wide fan pattern. Feathers an adujustable air intake valve which can be used in the fully open position, fully closed position, or anywhere in between, giving you a complete control of the amount of the soap/mixture. Contains one each of the following: Speedy super foamer black adjustable nozzle with air intake valve and 1/4" adaptor, hose tube, and 1 Liter bottle (tank). Liquid glass 9 hour protection. 10x harder than today's paint finishes! Pump is ideal for alkali's, detergents, waxes, and most mild acids. Designed to fit 3/4 in. and 2 in. PSI bung openings. The spout can be rotated to prevent dripping. 8 oz. per stroke with adjustable stroke tubes. Fits 15, 30, and 55 gallon drums. Foamer Gun - 1/2 gallon multi-ratio. Kit Includes : 1.7 oz./50mL ceramic coating. Applicators. Removal Cloths. Polishing Cloths. Nitrile Gloves. Car Brite Black Peral Ceramic Si02 coating provides a lasting, impermeable barrier that protects surfaces against the harshest of elements while providing a deep, rich gloss. The Si02 formula is a liquid glass coating resistant to scratches, acid, salt, chloride and alkaline making it far more durable than wax. The coating provides a near perfect surface creating a self-cleaning finish that helps prevent water spots and the adhesion of deposits while enhancing color and depth of shine. Plus, its anti-static properties help repel dust helping keep sirgaces cleaner - longer.